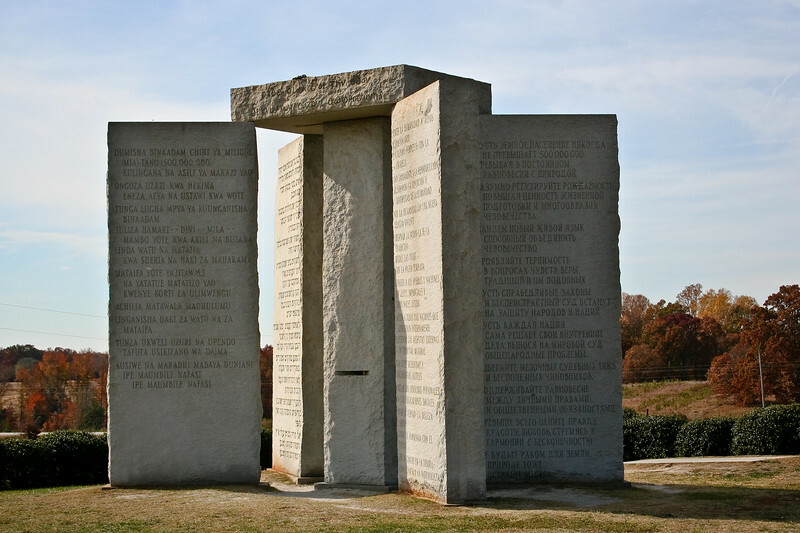 The Georgia Guidestones is a large granite monument in Elbert County, Georgia, USA. A message comprising ten guides is inscribed on the structure in eight modern languages, and a shorter message is inscribed at the top of the structure in four ancient languages' scripts: Babylonian, Classical Greek, Sanskrit, and Egyptian hieroglyphs. A message consisting of a set of ten guidelines or principles is engraved on the Georgia Guidestones in eight different languages, one language on each face of the four large upright stones. Moving clockwise around the structure from due north, these languages are: English, Spanish, Swahili, Hindi, Hebrew, Arabic, Chinese, and Russian.